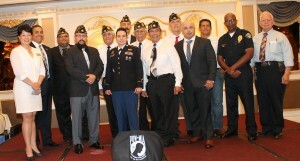 On August 28th veterans joined together with Post Commander Gabriel Suarez, Monterey Park Councilmember Stephen Lam, San Gabriel Vice Mayor Chin Ho Liao, Janet Chin representing Senator Ed Hernandez, and Antonio Chapa representing Supervisor Hilda Solis to raise funds for the roof of Post 397 in Monterey Park. 250 guests attended the dinner with live entertainment held on August 28th at the Capital Seafood Restaurant. The goal was to raise $50,000 to replace the roof on the building that was constructed in 1931. 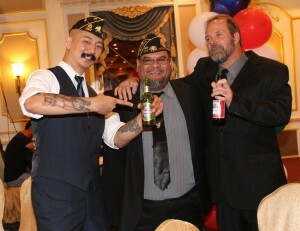 Gabriel Suarez, Jeff Chen and Vance Bloom were enjoying the party. 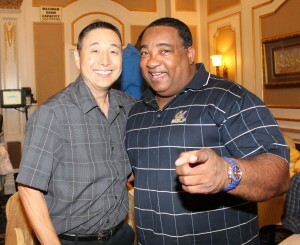 Scott Shimamoto was the Master of Ceremonies and Stevie Mack, one of the many entertainers for the evening. Mr. Shimamoto introduced the special guests that included: Congressmember Judy Chu, Janet Chin representing Senator Ed Hernandez, Assemblymember Ed Chau, Board of Trustee Mike Eng, Monterey Park Mayor Peter Chan, Councilmembers Hans Liang and Stephen Lam, San Gabriel Councilmember Chin Ho Liao, Garvey School Boardmember Henry Lo, Water Boardmember Thomas Wong, City Manager Paul Talbot, Fire Chief Scott Haberle, former Mayors David Lau, Anthony Wong and Francisco Alonso and City Clerk Vince Chang. He thanked all of the sponsors for their generous donations. 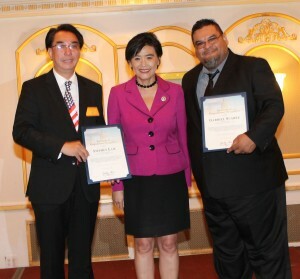 Congressmember Judy Chu, Commander Gabriel Suarez and Councilmember Stephen Lam celebrated the event. 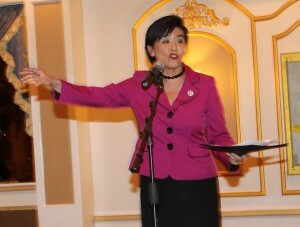 Congressmember Judy Chu was joined by some of the veterans at this fundraiser. Post Commander Gabriel Suarez welcomed everyone to this special event. 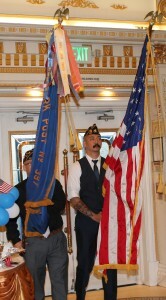 Members of the Post presented the colors as the audience stood at attention. Post Chaplin Tom McCrady thanked the audience for participating at this event. 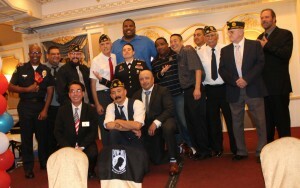 The American Legion helps all of the veterans. He asked God to bless the food and drink that we are about to receive. Commander Suarez led the Pledge of Allegiance and the audience joined in singing our National Anthem. 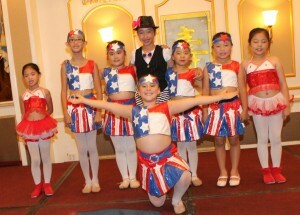 Cici Lau sang “God Bless America” with assistance from the guests. Congressmember Judy Chu said it was wonderful to be here to raise funds for a new roof for the Legion center. We need a new roof for our veterans. They sacrificed to keep us safe. 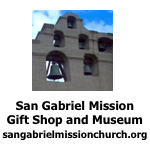 She is glad that Gabriel Suarez and the Post decided to raise funds for the roof. 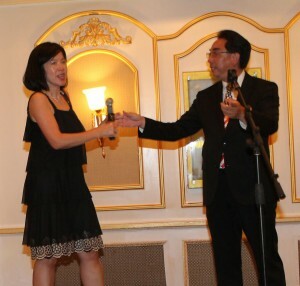 She thanked Councilmember Stephen Lam for organizing this fund raising dinner with the Post. She has a twenty-five year relationship with the Post. It has done remarkable things for our veterans. As mayor in 1991 she helped to raise funds for the War Memorial in front of City Hall. Her father was in the US Navy during World War II. It changed his life. He died this year at the age of 91. The Post did the ceremony and he is buried at their cemetery. We need to keep the Post opened to take care of our veterans. 2.8 million veterans sacrificed for us in Iraq and Afghanistan. She is working with Pasadena City College to establish a Veterans Health Center on their campus to serve the San Gabriel Valley. They have $300,000 for the infrastructure. The center should be opened in one to two years. The military motto is “No soldier left behind”. We must not leave the veterans behind. Congressmember Judy Chu thanked everyone for their support. She made a $1,000 donation to the Post. Please donate tonight for the veterans. 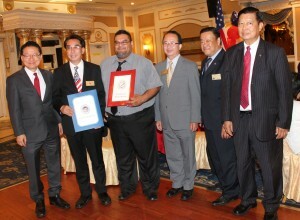 Congressmember Chu presented Commander Suarez and Councilmember Lam with Congressional proclamations. Mayor Peter Chan, Councilmember Hans Liang, City Clerk Vince Chang, former Mayors David Lau and Francisco Alonso joined in the celebration. 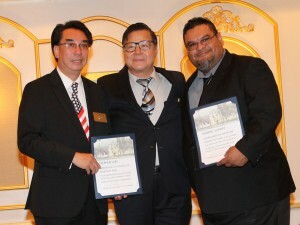 Mayor Chan joked that they did not bring proclamations but they brought cash to the dinner. We care for our veterans. Councilmember Liang said it is a pleasure to be here for this event. The Legion supports the city events. Post 397 is part of Monterey Park. He thanked Judy Chu and Stephen Lam for their support to put a new roof on the Post. City Clerk Chang stated the American Legion supports our veterans. He tells the new citizens about the American Legion and our veterans. He is helping to raise funds for the American Legion. Former Mayor Lau thanked Stephen Lam for this event. 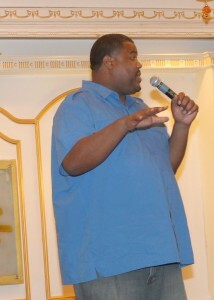 He took the leadership to organize this event. He thanked the Post for their support. He asked the country to recognize the veterans. We all support the veterans. We all will make the community safe for all. Former Mayor Alonzo thanked everyone for coming here to support a worthy cause. Staff Sgt. 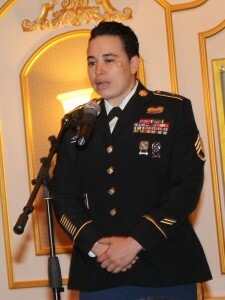 Dominique Hernandez served in Iraq from 2005 to 2010. She has a home at East Los Angeles College and Post 397. The veterans are at home at the Post. She thanked the residents for their support. San Gabriel Councilmember Chin Ho Liao said we need to support our veterans. Help them find jobs and go to school to be trained. 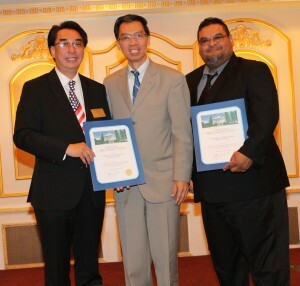 Councilmember Liao presented proclamations to Councilmember Lam and Commander Suarez. Garvey School Boardmember Janet Chin, Antonio Chapa, Commander Arthur Fong, Commander Gabriel Suarez and Councilmember Stephen Lam joined in the celebration. Janet Chin, representing Senator Ed Hernandez, said she is happy to be here today. The American Legion understands the veterans. She thanked the combat veterans. She thanked the Women’s Auxiliary and volunteers for this event. Antonio Chapa is Hilda Solis’ representative for the veterans. He sent greetings from Hilda Solis. Please contact him for any assistance. Commander Arthur Fong congratulated the Post. He said he hopes the Legion has enough money for the new roof. 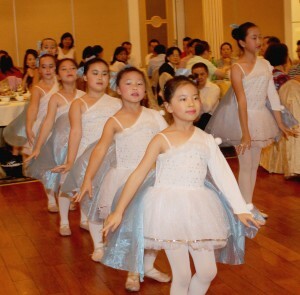 Members of the Grace Dance Academy entertained the guest with several numbers in their colorful dresses. 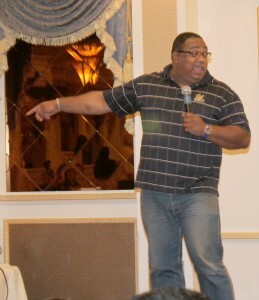 Stu Kosh told several jokes about dreams in Los Angeles, short jokes and his life in the Army. Cam Rowe joked about his life with his mother and his daughter. He is six foot nine and he failed at sports. He said never to give up. Be true to yourself. 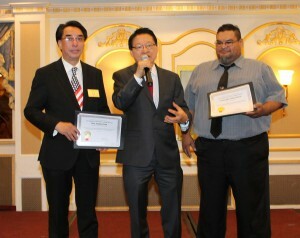 Assemblymember Ed Chau thanked the veterans and presented a check to Commander Suarez and Councilmember Lam for the Post. He thanked the Post for their service to the veterans. He applauded their work. 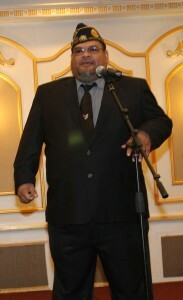 He thanked the sponsors and donors. 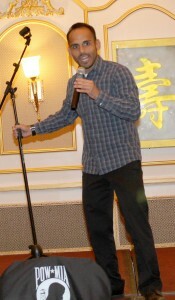 Artist Jian Hua Duan painted picture on brown paper with several different colors as the guests watched his performance. His picture was sold for $1,000 that evening. Gabriel Suarez asked the audience to give it up for the veterans and volunteers. You are helping our country and our veterans. He thanked everyone for their support. 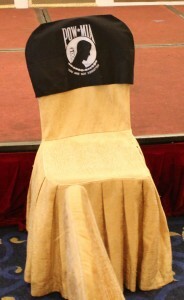 A chair is set up in memory of the Prisoners of War and Missing in Action from all of the wars to remind everyone that not every veteran returned home to their family. The Post never has an event without honoring their missing comrades. 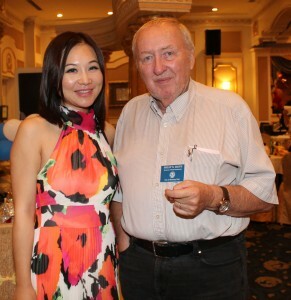 Anela Sheng and Philip Smith enjoyed the party. Councilmember Stephen Lam said his family emigrated from Hong Kong and chose America as their new home. They settled in Monterey Park, California for the weather 30 years ago. He met his wife, Jenny Lam in Monterey Park. They met at Cal State Los Angeles. Jenny Lam thanked everyone for their support. Stephen Lam said his family picked America for our freedoms. We all work together as a country. 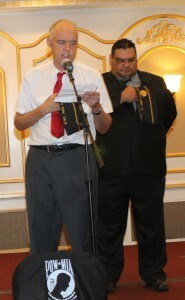 He thanked Gabriel Suarez for his support and service to the community. We work together for the community. He thanked God for a good turnout. The event raised $21,000 towards a new roof. Stevie Mack joked about Stephen Lam and the roof. He said that he had worked at the Boys & Girl’s Club and noticed the worn out roof on the Legion building. He enjoyed the food. He is full. He also told some Black jokes. Trustee Mike Eng joined Commander Gabriel Suarez, Mayor Peter Chan, former Mayor David Lau, Councilmember Stephen Lam and City Clerk Vince Chang. Mike Eng said his father was a World War II veteran. He remembered all of his buddies that died. We are putting a roof over our veterans. Stephen Lam thanked everyone for their generous support. He thanked Capital Seafood for their generous support. Veterans joined with elected officials and entertainers for a large group picture to celebrate this special occasion. The Post is still accepting donations for the roof. Please make your check payable to American Legion Post 397. Their mailing address is 338 S. Ramona Ave. Monterey Park 917554. Their Tax ID#: 95-6196698.